Taylor Burk spent a weekend on the road, with nothing but a camera and a hammock. His images and stories make us want to jump in the car and hit the back country. 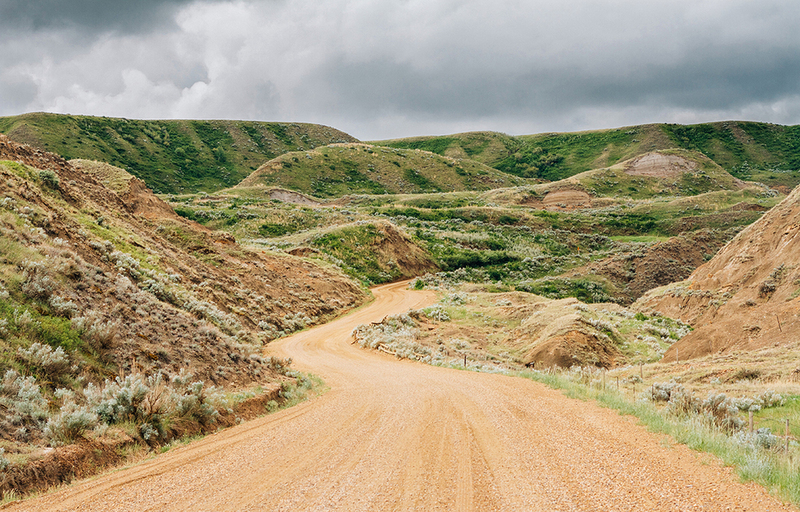 "With no exact destination set in place I headed south of Edmonton along the back roads towards the badlands, a place I have never explored before. I drove until it got dark, I set up my tent beside a quiet gravel road on the edge of a cliff. It was super windy and raining; needless to say I didn’t get much sleep. When I woke up at sunrise I was greeted with an incredible view of Dry Island Buffalo Jump Provincial Park. I packed up and continued south, trailing along and through the Badlands. I went out of my way a little bit to check out the “ghost town” of Rowley. It was so cool to see this old historic town accompanied with a few grain elevators (slowly disappearing in Alberta) and some Pronghorn, which I have never seen before! I finally made my way to Dorothy (another ghost town) with a few stops along the way. Every twist in the road had something to look at. Needless to say, I ended up stopping a lot. It was now getting late and I needed to find a place to camp out so I headed north on Highway 40. There were some people stopped on the side of the road taking pictures of what happened to be 3 Grizzlies. I have never seen so many in one spot before especially so close up. Just down from where the bears were was a camp site and I didn’t have any of the safety precautions for bears and I was in a hammock, so it was another sleepless night. When I woke up and left the camp site there were two Black Bears outside by the road. Slowly making my way home now, I made a quick stop at Barrier Lake which didn’t have a ripple in it other than the ones from my kayak. It was tough to leave. It was a weekend well spent in the diverse province I call home. "